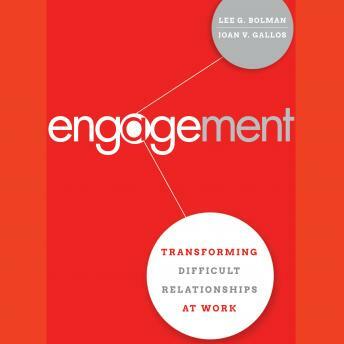 In Engagement, bestselling authors Lee G. Bolman and Joan V. Gallos offer a compelling workplace parable to illustrate the strategies and skills needed to make unworkable relationships positive and productive. The audiobook introduces the four-step SURE model, which offers rules of engagement for staying alert, grounded, and productive when faced with the prickly, taxing, or toxic folks who block progress, weigh you down, undermine your confidence, leave chaos in their wake, and cause a disproportionate share of headaches and sleepless nights. Bolman and Gallos advocate that deeply engaging oneself, one another, and the situation is the best route to transform difficult relationships. They show how to unhook from the anger, stress, and frustration that limit your ability to see and appreciate better possibilities. Working with difficult people-a problem employee, bully boss, chronically complaining coworker, mean-spirited associate, Machiavellian teammate, or troubled colleague- all take a combination of strategy, confidence, determination, and skill. The authors show how to apply the four-step SURE model for overcoming the obstacles and frustrations that difficult people present. Because it is written as a parable, Engagement offers you the opportunity to slow down and think about your reactions, compare your solutions with others, and view events through multiple perspectives-your own, the authors, and the characters in the story. Engagement helps to better understand yourself, respond more effectively in your workplace, and handle challenges in ways that bring out the best in you and others.